US President Donald Trump has lifted the controversial travel ban imposed on Chad about six months ago. According to the White House, Chad is “an important and valuable counterterrorism partner of the United States,” and has “shown willingness” to make improvements in immigration and border management. Chadian foreign minister, Cherif Mahamat Zene, welcomed the lifting of the ban and hoped the move will further strengthen the strategic partnership and cooperation between the two countries. Citizens from seven other countries are still banned from entering the US. They include Somalia, Libya, Iran, Syria, Yemen, North Korea and Venezuela. 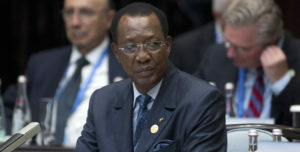 The Trump administration imposed the ban on Chad last year arguing that the Central African nation “does not adequately share public-safety and terrorism-related information.” The order also cites terrorist elements active within Chad or in the surrounding region, such as Boko Haram, ISIS, and al-Qaeda in the Islamic Maghreb (AQIM). “Making America Safe is my number one priority. We will not admit those into our country we cannot safely vet,” Trump tweeted in September. There have been numerous attacks by armed elements in the Lake Chad region throughout 2016 and 2017, where the terrorist group Boko Haram remains active. Ndjamena is home to the headquarters of the Multinational Joint Task Force (MNJTF) formed to tackle Boko Haram. Posted by Khalid Al Mouahidi on April 12, 2018. Filed under Zoom. You can follow any responses to this entry through the RSS 2.0. Both comments and pings are currently closed.